Aarsun Woods presents you this Beautifully handcrafted by skilled artisans from premium quality Teak Wood and dual polished. Wooden Mandir instills a sense of faith and peace to our homes. A large number of made to order designs available. The top consists of 3 domes, center dome larger than the adjacent two. The dome has a lustrous feel with traditional basic linear design. Below the Domes is a platform with floral carving at the end points. In front lies Mehraab consisting of Peacock Design. The Center , also known as Garbgriha, consists of 2 pillars attached to the back and two pillars in front of the temple. The pillars in front consists of Peacocks in front and sides at the top. The base of the front pillar consists of elephants carved out by skilled artisans. The back of the Garbgriha consists of floral design. The ceiling consists of Lighting Provision inside the Wooden Mandir. The base of the Wooden Mandir consists of a single pull out Drawer with Beautiful Carving in Front and Peacocks Carved out at the adjacent. Teakwood is the deciduous tree which is used from the centuries for making wooden furniture’s. Teakwood has its own natural oil which helps it to be termite and pest free. It is one of the most durable woods even when it is not treated with oil or varnish. We always use the old timber in making our products because the timber from old trees is more durable and harder in comparison to plantation grown trees. Teakwood is mostly used in making outdoor furniture’s and boat decks. Over the time teak wood can change its color into silvery grey finish when exposed into sunlight. 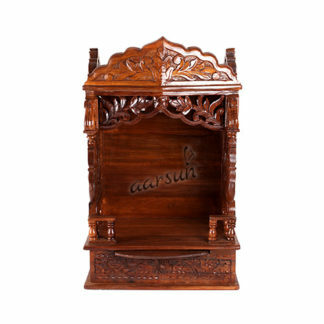 There are a number of designs available in Wooden Teak Wood Mandir, we suggest you to have a look at Teak Wood Temple , also at Aarsun Handmade Teak Wood Temple / Mandir / Mantap.